Linford of Alaska began in response to adversity in 1973 when the Linford family faced a financial crisis. The downturn in the oil industry at that time forced unemployment upon Russell Linford who was office manager for Western Geophysical, an oil field exploration company. Following his desire to go be self-employed, Russell pursued a search for a business to buy. Although this came as a surprise to his wife, Sue, and their five children, the family agreed that since everyone needs to eat, a food business looked like the best opportunity. Armed with a $50,000 bank loan secured through the Small Business Administration, Linford of Alaska was born. The existing business consisted of three refrigerated trucks, a driver Don Miller (who retired in 2002), and a small grocery route to "mom and pop" stores and blanket purchase agreements with the military. With Sue manning the office in their home, Russell driving one of the trucks, Don the other and inventory stored on the trucks, business started to grow. In fact, the pressures of their growing family and business combined with Russell's declining health placed such a strain on their marriage that Sue and Russell were divorced in 1983. In the settlement, Russell gained control of the business and Sue a large promissory note. Suddenly in March 1985, Russell was diagnosed with inoperable cancer and died two months later. The five children decided that to settle the note with Sue, it made the most sense, to ask her to return to the company and get it in shape. With daughter Julie who was a business student at the University of Puget Sound, Sue analyzed the health of the business that was then operating out of leased facilities, had seven employees, and $3.7 million in sales. 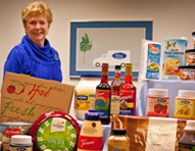 A short two years after she had left the business, Sue returned and took over as President and CEO of Linford of Alaska. The business grew moving into the computer age, adding customers and suppliers and soon outgrew the leased facility. In 1993 Linford became one of the only Alaskan businesses to relocate into the railroad/port area by purchasing an ''abandoned'' 44,000 square foot warehouse and 3.2 acres of land. Unattended for many years, the property under Sue's direction received a major face lift. Junk and garbage was removed, exterior lighting relocated and restored, landscaping planted, paving added, interior freezers and coolers installed, office space renovated and once again, business grew! Today, operating out of this new facility, Linford of Alaska is THE specialty food distributor in Anchorage. It boasts over $7 million in sales, just under 2000 on site inventory food service and retail items, and over 500 active customers ranging from military, hotels, restaurants, espressos and bakeries. Linford employs 18 full time workers, the majority of whom were born, raised and/or educated in Alaska. Sue takes a lot of pride in the minimal employee turnover. The hallmark of business success is its service and quality! Supreme service through its exceptional employees and quality through its high standard of products makes Linford of Alaska a success. Slow, steady growth has and continues to be the pattern for this Alaskan owned and operated business.